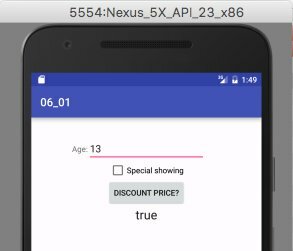 You can make meaningful use of Java’s logical operators in your Android app. In the code below, the app gets two pieces of information from the user. 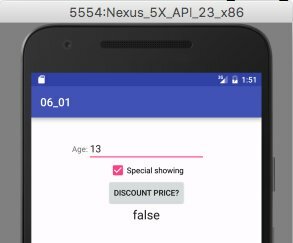 The app gets a person’s age, and gets a check or no-check, indicating a movie’s special showing status. There’s more to the app than the code. To create this app, you have to design the layout with its text fields, its check box, and its button. You also have to set the button’s onClick property to "onButtonClick". Every check box has an isChecked method and the isSpecialShowing variable gets its value from a call to the isChecked method. Here, the user hasn’t selected the check box. So, when Android executes the code, the expression specialShowingCheckBox.isChecked() has the value false. Getting a discounted movie ticket. But, in this image, the user has selected the check box. So, when Android executes the code, the expression specialShowingCheckBox.isChecked() has the value true. Paying the full price for a movie ticket. To make the code work, you have to associate the variable names ageEditText, specialShowingCheckBox, and outputTextView with the correct thingamajigs on the device’s screen. The findViewById statements help you do that.